Topkapi (1964) is a Technicolor heist film made by Filmways Pictures and distributed by United Artists. It was produced and directed by the emigre American film director Jules Dassin. The film is based on Eric Ambler's novel The Light of Day (1962), adapted as a screenplay by Monja Danischewsky. 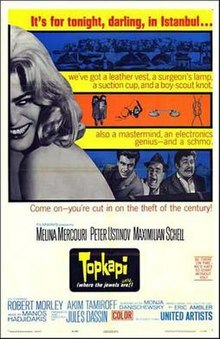 The film stars Melina Mercouri, Maximilian Schell, Peter Ustinov, Robert Morley, Gilles Ségal and Akim Tamiroff. The music score was by Manos Hadjidakis, the cinematography by Henri Alekan and the costume design by Theoni V. Aldredge. Elizabeth Lipp (Melina Mercouri) visits Istanbul, where she sees a traveling fair featuring replicas of treasures from the Topkapı Palace. Next she cases the Topkapi, fascinated by the emerald-encrusted dagger of Sultan Mahmud I. Leaving Turkey, she recruits her ex-lover, Swiss master-criminal Walter Harper (Maximilian Schell), to plan a theft of the dagger. They engage Cedric Page (Robert Morley), master of all things mechanical; Giulio, "The Human Fly" (Gilles Ségal), a mute acrobat; and the burly Hans (Jess Hahn), who will provide the muscle needed for the job. Harper and Lipp then hire small-time hustler Arthur Simon Simpson (Peter Ustinov) to drive a car into Turkey to transport hidden explosives and firearms for use in the burglary. Simpson, knowing nothing of Harper's and Lipp's plans, is arrested at the border when Turkish Customs find the firearms. Because Simpson has no information for Turkish police, they conclude that the weapons are to be used in an assassination. Turkish Major Turfan decides to use Simpson to spy on Harper and Lipp for the police. Page, picking up the car in Istanbul, is told a police ruse that only the "importer" Simpson is permitted to drive it in Turkey. While traveling with the gang, Simpson leaves cryptic notes for his police handlers, but most of his intelligence is worthless since Simpson is still ignorant of the plan. Hans' hands are injured in a scuffle with the drunken cook, Gerven (Akim Tamiroff), and Simpson is engaged as a substitute, prompting him to confess that the police are watching them. Knowing they face arrest if they try to escape Turkey, or use their equipment, Harper improvises a new plan in which they will give the still-oblivious police the slip, and steal the dagger without using their weapons. Then they'll "surrender" to the police, and claim to have found explosives in their car. Just before they leave, Simpson discards his last note, then leaves with the others. Harper arranges to give the police the slip. That evening, Harper, Simpson, and Giulio steal the dagger and leave a replica in its place. Unnoticed by the thieves, during the robbery a bird flies through the window they entered and is trapped inside the room when the window is closed. The gang deliver the dagger to Joseph (Joe Dassin), proprietor of the traveling fair display, who will smuggle it out of the country. The gang members then go to police headquarters to "reveal" their discovery of weapons in the car. The inspector asks Simpson to vouch for Harper and Lipp's whereabouts that day. Simpson, seeming to waver, throws in his lot with the others, and backs up their alibi. Before the police release Simpson and the others, the trapped bird in the Topkapi triggers the alarm, alerting police officers across Istanbul. When word of the Topkapi alarm reaches the police, Major Turfan confronts the thieves, displaying Simpson's last note, which has just enough information to link all of them to the theft. Turfan tells them all that he now knows why they were in Turkey. "A little bird told me," he says. Ultimately, the gang is seen in a Turkish prison, where Lipp begins to tell them of her fascination with the Russian Imperial Crown Jewels in the Kremlin. The end title sequence shows them apparently escaped from jail some time later and walking in snow by a Russian city. Ambler's novel is different from the movie on several counts, with the story narrated by Simpson (named Arthur Abdel Simpson in the book), so that the reader only gradually comes to work out what Harper and his associates are really up to. Simpson in the book is blackmailed into driving the car to Istanbul after Harper catches him trying to steal Harper's travelers' checks. The book features frequent flashbacks to Simpson's schooldays in England, which help to explain his character and motives more clearly than in the film. According to Jules Dassin, he originally planned to cast Peter Sellers as Simpson, but Sellers refused to work with Maximilian Schell, who he claimed had a reputation for being difficult. Dassin was not prepared to dispense with Schell, and so cast Ustinov in place of Sellers. Although he played one of the movie's leading roles, Peter Ustinov was nominated in 1964 for—and won—the Academy Award for Best Supporting Actor rather than the Academy Award for Best Actor for his portrayal of Simpson. In an interview given on Ustinov's death in 2004, Maximilian Schell surmised that this may have been due to the misconception that a servile individual like Simpson could only be portrayed via a "supporting actor" role. Appearing in supporting roles were Gilles Ségal as the human "fly" and Joe Dassin as Joseph, who runs the traveling fair display that is supposed to smuggle the dagger out of Turkey. The athletic Ségal later inspired other 'trickwire' stunts, including a few used for the Mission Impossible TV show and movie. Joe Dassin was the son of the film's director Jules Dassin: he appeared as an actor in a handful of films, but was better known as a singer-songwriter. The film was shot on location in Istanbul, Turkey, in Kavala, Greece, and in Paris at the Boulogne-Billancourt Studios. The film earned $7 million at the box office, earning $4 million in US theatrical rentals. Topkapi was released to DVD by MGM Home Video on December 11, 2001 as a Region 1 widescreen DVD and on October 7, 2014 by Kino Lorber as a Region 1 DVD and Blu-ray. ^ a b Box Office Information for Topkapi. The Numbers. Retrieved May 19, 2013. ^ a b c d e f g Crowther, Bosley (September 18, 1964). "Topkapi (1964) TOPKAPI". The New York Times. Wikimedia Commons has media related to Topkapi (film).